YachtLegend Route for the Cyclades Islands in Greece. The Cyclades route starts from the city of Lavrion, just south of Athens. Fly into ATH and take the bus or taxi transfer to Lavrion port. A great guide for making the transfer can be found here. What a good time to take a couple days on either end of your trip to visit some of the best-known and best-surviving archaeological wonders of ancient Greece! ATH - Athens International Airport "Eleftherios Venizelos"
We begin in Lavrion! Less than an hour from Athens by taxi, this city has quite the history. It is best known for its silver mining. In fact, the silver mines date back to prehistoric times and are believed to be the oldest in the world! These mines financed the Athenian fleet that defeated the Persians, the building of the Acropolis, as well as the other monuments of the Athenian Golden Age. The port of Lavrion was in terrible disarray until a few short years ago. The town is now a thriving spot of culture, food, and tourism. Up and at 'em! We're going sailing! Pack your bags, gather your big floppy hat and your flippy-floppies - it's time to board a sailboat! You’ll now embark upon one legendary week where your only vehicle is a yacht; your thoroughfare the sea. All guests will board yachts on Saturday afternoon. You'll get a chance to move into your cabin and get settled with a cold glass of bubbly while exploring all your yacht has to offer. Grab something boozy, unwind on the spacious teak deck, and get acquainted with the yacht and some sailing basics with help from your skipper. After getting settled in your yacht, stroll into town for a dinner in one of the oldest locations of the Aegean sea. Get to know your flotilla over wine and lamb enjoying the thought that you'll soon have some wonderful photos to make your friends jealous back home. Our first natural bay on this adventure! Syros, like all the Cyclades, has a history of changing hands (via war) over its long story. 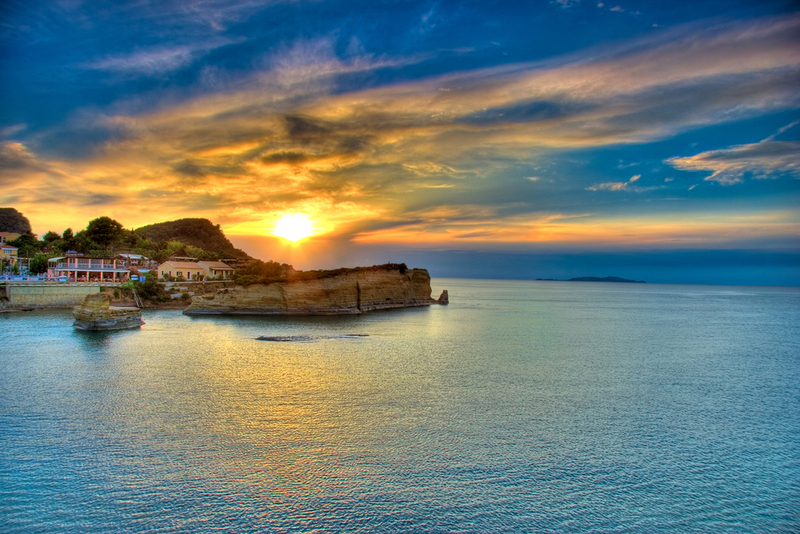 Ermoupoli is the capital of the island and of the Cyclades. It has remained a significant port to the island throughout its history. We are planning on staying on the northern side in a remote natural bay with some history of its own. A temple built in the third century pays homage to the patron of travelers, Asclepius. Many seafarers have taken refuge in this bay and have left inscriptions in the rocks and walls of the temple (Grammata translates as letters). They would use the lookout of Skopi at Grammata to observe the sea conditions. We will be in good company of ancient sailors here! How many thousands of years? Welcome to Mykonos! Named after Apollo's son (or grandson, depending on which version of the myth) Mykonos, is the location of a great battle between Zeus and the Titans. Supposedly, Hercules lured the invincible giants out of Mt. Olympus and killed them here. The large rocks all over the island are the petrified testicles of the Titans, hence the term “stones”! We are staying here for 2 nights! Plenty to do and see, so we don't want to skimp on our time here. Check out the famous windmills that were built in the 16th century for milling grain. Rent scooters to tour the island! Head over to Delos via water taxi for an archaeological wonder. Delos is one of the most important archaeological sites in Greece. This is the supposed birth place of Apollo and Artemis and has stone huts dating back to 3000 BCE. Since we'll be on Mykonos for two nights, this is your day to explore what the island has to offer! Nearby island of Delos offers wonderful excursions to ancient archaeological sites. Get a chance to spend a night ashore at one of Mykonos' stunning hotels. Up early for a beautiful sail west past Delos, Rineia, and Syros to Kythnos! We aim to drop anchor in a small town, Loutra this evening. We'll find out why the ancients termed this island Thermia: it has hot springs that are believed to have curative powers! After two nights in Mykonos, a good long soak is just what's in order. This is probably why the oldest known Cycladic habitation was formed just north of here between 10000 BCE and 8000 BCE! No rush this morning! Sleep in, grab a bite in town, sneak one more beautiful soak in those hot springs...we're just sailing around the corner today! Aiming for a remote natural bay will allow us the freedom to be ourselves late into the night...or early into the morning if we so desire. Kolimpithres or Kolona bay is renowned for its fine sand. We'll have a stunning sunset and then sunrise here! Kythnos has a very storied history: it has changed hands many times (from the Carians, to the Dryopes, then to the Byzantines and on to the Franks and Venetians) and was plagued by pirates for centuries. It was also part of the metallurgy trade during the Bronze Age, supplying the surrounding area with copper. The island is still fairly underdeveloped and not as touched by the tourism hand as other Cycladic islands. It's a perfect place for us to raft the yachts together and celebrate the week in style! Alas, all wonderful things....Our sail home begins today. Get those last swims and halyard swings in today prior to our arrival in Lavrion. A great final dinner will be enjoyed on the town. We spend our last night together on the yachts in the marina reveling in our amazed-ness. Screw it, let's do this again.